On May 15th, jury selection will begin on a grisly organized crime murder trial in Brooklyn. Roy Lindley DeVecchio, a former FBI Supervisory Special Agent, known in the Bureau as “Mr. Organized Crime,” will face charges that he conspired with a psychotic wiseguy hitman to murder four people, including a beautiful waitress. Normally, this would be fodder for the New York tabloids, but this trial is different. A re-examination of the DeVecchio charges could tarnish the reputations of a number of prominent ex-Feds, from presidential contender Rudy Giuliani to ex-FBI Director Louis Freeh. Even Hillary Clinton could be impacted, since a cover-up of the murder-conspiracy scandal took place on her husband’s watch in 1996. The Justice Department is so worried about the outcome, that a few weeks back, they moved a top al Qaeda terrorist into a cell next to the ex-wiseguy who will be the Brooklyn D.A.’s star witness. 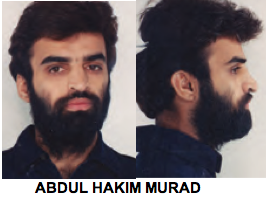 As reported first on my website, Abdul Hakim Murad, sentenced to life for the 1995 Bojinka plot to smuggle bombs onto U.S. airliners, was moved by the Bureau of Prisons, to a jail cell in Lower Manhattan next to Gregory Scarpa Jr., a former Colombo Family member who will testify that his father, Greg Sr. known as “The Grim Reaper” and “The Killing Machine,” was in a corrupt relationship with DeVecchio. Family members and lawyers close to the case fear that the move may have endangered Scarpa Jr. who gave the FBI a treasure trove of evidence in 1996 on Murad and convicted World Trade Center bomber Ramzi Yousef. All three prisoners had been inmates at the ADX Florence, the notorious Supermax prison in Florence Colorado but had been separated for years since Scarpa Jr. informed on Murad and Yousef during an 11 month FBI sting that began in 1996. On December 6th, 2006 Scarpa Jr. was moved from the Supermax to the Metropolitan Correctional Center in Lower Manhattan (M.C.C.) where he is expected to be the linchpin witness in DeVecchio’s upcoming trial on four counts of second degree murder. Sources close to Scarpa Jr. reported last week that Murad had been flown across country from the ADX Florence by BOP officials and installed in a cell at the M.C.C. immediately adjacent to the ex-Colombo Family wiseguy. The BOP Inmate locator shows both Scarpa Jr. 55 and Murad, 38, in residence at the M.C.C. as of March 13th, 2007. Scarpa Jr.’s file also references his father Gregory Sr. who died of AIDS in prison in 1994. Also known as “The Mad Hatter,” Scarpa Senior had been a notorious hit man for the Colombo crime family. Brooklyn D.A. investigators believe that he was the primary shooter in the early 1990′s “Colombo War;” a bloody battle for control of the family that left at least 12 dead. The indictment charging DeVecchio in four of those homicides, alleges that that the 33 year FBI veteran, who was Scarpa Sr.’s control agent, passed on key FBI intelligence including the location of mob rivals allowing Scarpa Sr. to wipe them out. In May, 1995, in the middle of a two year FBI OPR (internal affairs) investigation prompted by three agents who served under DeVecchio, Ellen Corcella, a prosecutor in the Eastern District of New York (EDNY) senta letter to a series of mob defense lawyers admitting to up to 8 separate instances where DeVecchio may have disclosed information to Scarpa Sr. on his rivals. DeVecchio has steadfastly maintained his innocence, claiming that in his dealings with Scarpa Sr. he was acting under “express authority” conferred on him in his capacity as an FBI SSA. On March 6th, following my discovery of a fund raising e-mail from “The Friends of Lin DeVecchio Trust,” The New York Daily News broke a story in which FBI spokesman John Miller admitted that the Justice Dept. was paying some of the legal fees for DeVecchio’s defense. Last year DeVecchio attempted to have his case removed from State Court in Brooklyn to Federal Court arguing that very point: that in his capacity as the SSA running the Colombo Task Force, his “clandestine relationship” with Scarpa Sr. was effectively sanctioned and that he was immune from prosecution. But on January 9th, in a 27 page decision, a Federal judge rejected those arguments and the case is moving forward in Brooklyn. The ensuing scandal threatened, in the words of Federal Judge Jack B. Weinstein, to “unravel” the remaining 60 “War” cases. DeVecchio had also supervised “The Commission Case,” the historic 1986 mob-busting trial that resulted in the jailing of New York’s top Mafia bosses and helped make the career of Rudy Giuliani, then U.S. Attorney for the Southern District of New York (SDNY). Almost a decade later at one “Colombo War” hearing, DeVecchio testified that he’d been sanctioned in his dealings with Scarpa Sr. at the highest levels of the FBI. But he also invoked the Fifth Amendment and answered “I don’t recall” more than 40 times after a grant of immunity, tactics virtually unheard of from an active duty FBI agent. Nonetheless, by September of 1996, the two year OPR was closed and DeVecchio was allowed to retire with a full pension. Then, in 2005 Brooklyn D.A. Charles “Joe” Hynes impaneled a grand jury and on March 30th, 2006, DeVecchio was indicted on four homicide counts relating to his relationship with Scarpa Sr., an FBI Top Echelon (T.E.) informant who only served 30 days in a 30 year career of racketing, drug dealing and murder. Scarpa’s son Greg Jr. later gave details of his father’s alleged corrupt relationship with DeVecchio, whom the Colombo killer nicknamed his “Girlfriend.” The younger Scarpa claimed that in return for intelligence that helped him wipe out his rivals, Greg Senior had paid thousands of dollars to DeVecchio, flown him on trips to places like Aspen, Colorado and even entertained him with call girls at a Staten Island hotel. In an April 15th, 2006 piece, Alan Feuer reported in The New York Times, that in 1976 Rudy Giuliani, then a Deputy Attorney General in Washington, quashed a possible federal prosecution of DeVecchio who was caught selling antique handguns worth $60,000.00 to undercover ATF agents. Against the wishes of a Maryland federal prosecutor who wanted to go forward, Giuliani reportedly terminated the case. Giuliani, a recently announced Presidential candidate, isn’t the only prominent ex-Fed whose reputation could be tarnished if DeVecchio is convicted. Also in positions to lose are former FBI Assistant Director In Charge James Kallstrom who ran the FBI’s New York office, former FBI Director Louis Freeh who prosecuted The SDNY’s Pizza Connection case, Patrick Fitzgerald, the former head of Organized Crime & Terrorism in the SDNY, Dietrich Snell, a former SDNY prosecutor, now a senior attorney in the office of New York Gov. Elliot Spitzer and Valerie Caproni, former EDNY criminal division chief who is now General Counsel to the FBI. Back in 1996, Each of them signed off on the closure of the DeVecchio OPR a move that allowed “Lin” as he’s known, to retire with a full pension. In a 2004 hearing Judge Weinstein rejected Scarpa Jr.’s testimony about DeVecchio, but investigators for the Brooklyn D.A.’s office believe him and he was brought out of the Supermax and installed in a cell at the M.C.C. where he is expected to be the key to the four count murder prosecution. Abdul Hakim Murad, who grew up in Kuwait with Ramzi Yousef, is one of the highest ranking al Qaeda operatives ever convicted in the SDNY. A pilot trained in four U.S. flight schools between 1991 & ’92, Murad was to have been the lead pilot in Yousef’s original “planes as missiles plot” that culminated on 9/11. After a fire destroyed their bomb factory in Manila, Yousef fled to Pakistan where he was arrested in February 1995. Murad was captured the night of the fire and interrogated over 67 days by the Philippines National Police (PNP). He confessed the full blown “planes operation” to PNP Col. Rodolfo B. Mendoza who passed the details of the plot to the FBI’s Legal Attaché in Manila. The LEGAT, in turn, sent the intelligence to the SDNY where prosecutors in 1996 where preparing to try Yousef, Murad (later rendered back to the U.S.) and a third co-conspirator Wali Khan Amin Shah. All of this is documented in TRIPLE CROSS, my third investigative book for Harper Collins focusing on the FBI’s counter-terrorism record. A 32 page illustrated timeline from the book can be downloaded from my website. Murad’s role as lead hijacker/pilot was ultimately assumed on 9/11 by Mohammed Atta. On November 3rd, 2005, a close member of Greg Scarpa Jr.’s immediate family received a letter from the Supermax prison mailed on October 31st. “It was a very specific threat to Greg’s family members from al Qaeda-related inmates at the ADX Florence,” says Angela Clemente, the forensic investigator who uncovered most of the documentary evidence and key witnesses for the upcoming King’s County murder prosecution. “Incredibly, the Bureau of Prisons had somehow switched Greg Jr.’s mail with the mail of Eric Rudolph” (the convicted Olympic Park Bomber) she says. This allowed Rudolph to obtain the return addresses of Scarpa’s family members. “Rudolph was in a cell at the Supermax right next to Ramzi and right after that, Yousef began screaming at Greg Jr and threatening him,” says Clemente. Clemente says that she herself received a similar threat letter from the Supermax sent to her home in Bayonne, New Jersey. Clemente says she immediately alerted the office of Congressman Dana Rhorabacher (R-CA) whose International Relations Subcommittee was then investigating a possible Philippines connection between Ramzi Yousef and convicted Oklahoma City bomber Terry Nichols. Rhorabacher reportedly contacted the Capitol Police who turned the matter over to the FBI. Worse, says Clemente, the FBI never even questioned the member of Scarpa’s family who was reportedly threatened. This wouldn’t be the first time that the BOP raised security concerns when it comes to Greg Scarpa Jr. In 2004 when I was researching COVER UP, Greg Jr. agreed to an interview.